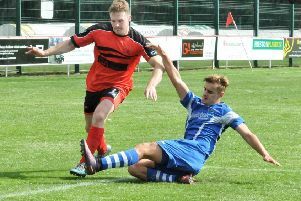 Garstang moved into the next round of the First Division Cup as they defeated Longridge Town on penalties after a 1-1 draw. Longridge have not lost a home league game for almost three years but Saturday was their second cup defeat in as many games at the Mike Riding Ground. Manager Lee Ashcroft had a strong squad to choose from with Danny Gardner replacing Joe Melling in the starting XI with the latter carrying over an injury from the midweek win at Atherton LR. In contrast, Garstang manager Lee Baker was again without Dan Birch and Josh Westwood, while Jake Salisbury was a late withdrawal and Jack Swindlehurst failed a fitness test. Despite that, Baker put out a side that not only proved to be ultra-competitive but also executed tactics that nullified Longridge’s strengths and ensured Garstang were always in the game. Richie Allen flashed a header wide but, otherwise, Will Kitchen in the Garstang goal was untroubled in the opening 30 minutes. The visitors continued to sit deep, conceding possession on the halfway line and being very disciplined in their defensive shape. Garstang had started with Alan Coar up front on his own and Cameron Ross deployed just in front of the Garstang backline with the added of advantage of being able to drop into the line to make it a defensive five as required. On paper it could have been regarded as a defensive formation but, throughout the first half, they often counter-attacked at speed with Shaun Sailor and Jonny Hothersall breaking quickly to support Coar. Coar and Sailor had opportunities to break the deadlock, while a surging run from Sailor saw him brought down inside the area. Tom Entwistle stepped up but Lee Dovey guessed the right way and was able to save his spot-kick. Hothersall also beat two players and saw his cross come off the bar as the first half ended goalless. The second half started as expected with Longridge upping the tempo and pressing Garstang further up the field. There was a 10-minute period when Longridge looked very dangerous and Kitchen was called on to make a number of saves. Eventually the pressure paid off on 54 minutes as Allen was able to beat two defenders and shoot home from inside the box, giving Kitchen no chance as Longridge took the lead. Baker made a tactical switch, pushing Ric Coar up front alongside substitute Billy McKenna with a change in formation giving Longridge a little more space to play. They really should have made the game safe as Allen and Jay Hart were guilty of missing several chances, over-elaborating at times when well placed, while Allen also had a goal disallowed for offside. As the half progressed, Garstang became more threatening with the game increasingly stretched. They drew level with 10 minutes left when Ric Coar pounced on Sailor’s through ball, and although Town felt he looked offside, the striker drew the keeper and slotted home. Both sides had opportunities to win the game in normal time. Once again, the ever-dangerous Sailor broke free down the right and hit a low cross-shot from the edge of the box, which Dovey brilliantly tipped away at full stretch. With no further goals, it meant the game went to penalties and, in Kitchen, Garstang have a keeper who has an enviable record with penalty saves, having kept out two of the three spot-kicks he had already faced this season. Garstang held their nerve as all four of their penalty takers found the net with Billy Akrigg, Kieran O’Connor, Sailor and Tom Graham the men on target. Kitchen then did his bit, brilliantly saving two penalties from Alex Murphy and Paul Turner to give the Riversiders a 4-2 victory on penalties.